What is the main reason you ask yourself what is the weather today? Is it because you want to know about the; humidity, pressure, dew point, wind chill and the chance of precipitation? Alternatively, like me, do you just want to know how many layers of clothes you will need to put on? 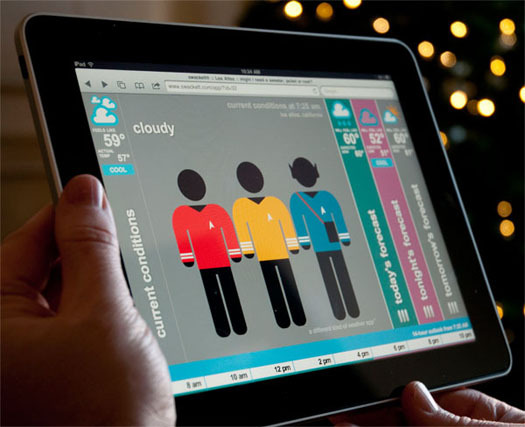 Swackett, the slang term for sweater, jacket or coat is a new mac app (ipad and iphone to launch soon) that makes understanding that makes understanding the weather simple. It is made by AGLogic a special subsidiary of AGI that focuses on intelligent software design. Swackett is targeted at children, the elderly and the lazy (people like me). The weather is forecasted by what the cartoon figures are wearing (with labels). The cartoon people are lovingly referred to as ‘peeps’. The peeps come with different styles of clothing. There are fun editions of peeps, like the British Invasion Edition (think Beetles clothing) and the 1950’s edition (think Elvis and John Wayne style clothing). There are also hints on the website the peeps will be available in the awesome Star Trek edition (think Fatema’s eyes watering with anticipation). A step up from Umbrella Today, Swackett is a beautifully designed application, simple to use, easy to understand and a fun little time saver. The Swackett app is available for free download on the Mac App Store.